Spring Collection Day is Wednesday, April 24! Join Sustainable UF Wednesday, April 24 for our Spring Collection Day! 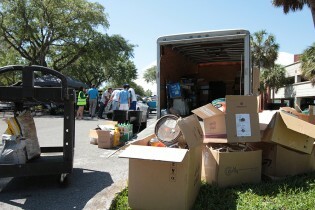 This event makes it easy and convenient to get rid of unwanted household items, clothing, hazardous waste, old electronics, furniture, appliances, and non-perishable food items. Usable items will be donated for use in the community, and damaged goods, hazardous waste, and electronic equipment will be recycled or disposed of safely and responsibly by our partnering organizations. Toiletries and gently used clothing will be donated to UF HealthStreet and household items will benefit Habitat for Humanity. Collection Day will take place on Wednesday, April 24, from 7:30 am – 1:00 pm in the NW corner of the O’Connell Center Parking Lot.